In feng shui, knowing the direction your house is facing is necessary in order to calculate various feng shui analyses. The only way to determine this direction is with a compass. You have to determine two feng shui directions for your house location. One is the facing direction of your home and the other is the sitting direction. The facing direction describes the direction that the front of your home faces. To get an accurate reading, however, you'll need to use a compass. The sitting or mountain direction is opposite your home's facing direction. It is typically the backyard of your house. The direction or orientation of your home is important in performing accurate analyses to determine how the chi flows in and around your home. You need these analyses in order to determine if you need to apply any feng shui remedies and cures. What surrounds your home is far more important than the structure or interior of your home. If there are inauspicious land formations surrounding your home, no amount of feng shui cures conducted on your home interior will remedy the exterior. That's why traditional feng shui places so much attention and importance on compass and landform. Classical feng shui states that what you've determined to be the front of your home, such as the front door isn't always the actual facing direction of your home. Feng shui practitioners base this principle on land formation theories for the street with the most active energy. Traditionally, the side of your home that overlooks the most yang energy is considered the front of your home, regardless of what you've designated as your front door. 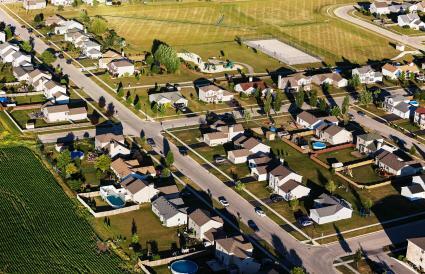 For example, if the street on the front door side of your home has little traffic and another street that runs along the side of your home has more traffic, then the busier street is considered the facing direction. There is a catch to using the higher yang energy side of your home There needs to be a door on that yang side of the house to allow the auspicious chi to enter your home. If you don't have a door on that side of the house, then use your front door to take a compass reading for the facing direction. You can redirect much of the side street yang energy to your front door through landscaping. The yang side rule is especially helpful in determining the facing direction of an apartment building. If both streets are equal in traffic, then go with the front door street. Ninth floor and above apartments always use front door (building entrance). Taking a compass reading is the only way to get a true reading to ascertain the magnetic facing direction. Take the reading from the front of your house (front door). This is the location where feng shui practitioners stand to get the first compass reading. A feng shui master will examine and evaluate your home to determine which side of your home is the true front or facing direction. Again, most people will use the front door for the facing direction. A compass is the only way to get an accurate reading of the facing and sitting directions of your home. Many people conducting their own feng shui compass readings do it incorrectly. This reading is the basis for all of the analyses that follow. It's imperative that it is accurate. Creating analyses based on inaccurate readings is worse than doing nothing to correct or remedy inauspicious elements in your home. You will use the compass to get a reading for the facing direction of your home. This will be a reading of degrees. The sitting direction will then be the direct opposite of the facing direction. The easiest compass to read is one used by hikers and campers. 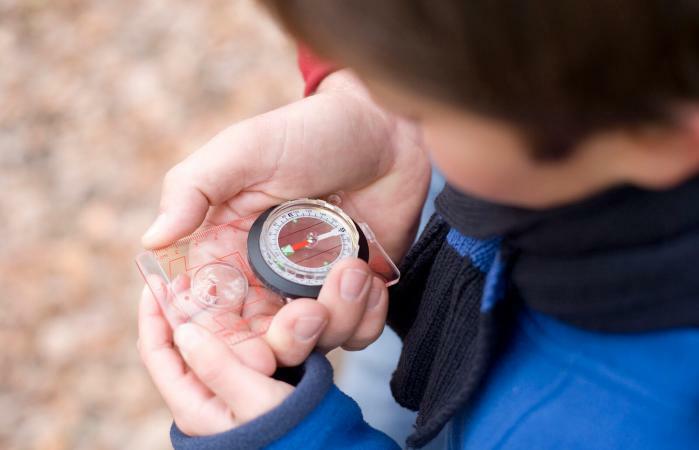 A Girl or Boy Scout compass is an excellent tool for you to use in finding the facing direction of your home. More advanced feng shui students will own a Luo Pan or Lo Pan compass and know how to interpret and use it for the overall analysis of a home. The main direction you should be concerned about obtaining is the magnetic North. Once you have this reading, the rest will be easy. Once you've taken all three readings, compare them. The readings shouldn't be more than a degree or two difference. In some cases, there won't be any difference in the readings. If you have more than five degrees difference in any of the readings, you have an error somewhere and need to perform the process again. Add the three readings together and divide by three. The remaining number is the degrees you'll use in your analysis calculations. The two main analyses that utilize compass readings are the Flying Star and Eight Mansions. Each analysis is calculated and used separately. Feng shui practitioners use the Flying Star analysis in correlation to your facing direction and the year your home construction was complete. Flying stars provide an exact map of how the chi energy moves throughout your home. There are nine stars and correlate to the nine-star formation of the Great Bear (Ursa Major constellation). Each is assigned a number to represent specific properties. The flying star theory maps the movement of these stars, including the auspicious and inauspicious (afflicted) energies they bring into a sector in your home as they move about the heavens. The main use is to calculate the annual flying stars as well as monthly flying stars. The stars determine the luck for each sector in your home. Feng shui offers specific remedies for any afflicted sectors and ways to capitalize on the visiting auspicious stars. The Eight Mansions analysis uses the compass sitting direction and in an ideal world will make the Kua of the person in the household considered to be the provider (breadwinner). Black Hat feng shui (BTB) ignores compass school of feng shui and uses a hybrid bagua that is placed over the home layout. This cookie cutter approach uses the bagua the same way for every home. This means the BTB bagua chart is placed over the house layout with south always at the top of the layout opposite the front door. That makes north the facing direction irrespective of the actual compass facing direction. In Classical Feng Shui, the house facing direction dictates the rest of your house analyses. Once you understand the importance of facing and sitting feng shui house directions, you can determine the location of each sector and move forward with other feng shui analyses needed for your home.